IHDP Writing Contest: Submit by 5/15! The deadline for the International Human Dimensions Program's Secretariat's Writing Contest has been extended to May 15 to accommodate the coming spring semester. Young scholars are invited to take part and write an article for the third issue of the Dimensions magazine, to be published mid 2013. The issue will focus on the human dimensions of the Sustainable Development Goals that have been widely discussed in the context of the Rio+20 summit. The magazine is directed towards a wider audience, including non-scientists interested in the topic. Upon expiry of the submission deadline, the Secretariat will select up to three winners to be awarded cash prizes ($500, $200, and $100) - and will publish their work in the magazine (print and online). More information about the contest can be found here. Background: The Canadian Community of Practice in Ecosystem Approaches to Health (CoPEH-Canada) was launched in 2008, with initial funding from the International Development Research Centre (IDRC) and subsequent support from a Public Health Agency of Canada grant entitled "Linking public health, ecosystems and equity through ecohealth training and capacity building". The CoPEH-Canada is a collaboration between nine Canadian universities (University of British Columbia, University of Northern British Columbia, University of Calgary, University of Guelph, University of Toronto, York University, Université de Moncton, Institut national de la recherche scientifique and Université du Québec à Montréal). The COPEH-Canada's primary objective is to promote and support research, education, policy, creativity, scholarship, critical thinking, and practice in ecosystem approaches to health. As part of the educational mandate of this initiative, CoPEH-Canada will be hosting its sixth annual 11-day, short course entitled Ecosystem Approaches to Health (Ecohealth) in conjunction with the University of Northern British Columbia, Canada from June 20th to June 30th 2013. 1. Ecosystem Approaches to Health Workshop (June 20-23) with ~25 participants, and a teaching team involving members of CoPEH-Canada from across Canada; the workshop is open to professionals, practitioners and graduate students. CoPEH-Canada team members. Final assignments will be completed in July. Graduate Training Awards: Graduate students wishing to participate in the full 11-day field-school may apply to receive one of five (5) $1000 awards to help cover the costs to participate in the full 11 day Ecosystem Approaches to Health Field Course. The EcoHealth Student Journal Club will be meeting on March 13 at 3pm EST (New York Time) to discuss Dr. Dominique Charron's article "Ecosystem Approaches to Health for a Global Sustainability Agenda". International research agendas are placing greater emphasis on the need for more sustainable development to achieve gains in global health. Research using ecosystem approaches to health, and the wider ﬁeld of ecohealth, contribute to this goal, by addressing health in the context of inter-linked social and ecological systems. We review recent contributions to conceptual development of ecosystem approaches to health, with insights from their application in international development research. Various similar frameworks have emerged to apply the approach. Most predicate integration across disciplines and sectors, stakeholder participation, and an articulation of sustainability and equity to achieve relevant actions for change. Drawing on several frameworks and on case studies, a model process for application of ecosystem approaches is proposed, consisting of an iterative cycles of participatory study design, knowledge generation, intervention, and systematization of knowledge. The beneﬁts of the research approach include innovations that improve health, evidence-based policies that reduce health risks; empowerment of marginalized groups through knowledge gained, and more effective engagement of decision makers. With improved tools to describe environmental and economic dimensions, and explicit strategies for scaling-up the use and application of research results, the ﬁeld of ecohealth will help integrate both improved health and sustainability into the development agenda. Full reference: Charron, D. F. (2012). Ecosystem Approaches to Health for a Global Sustainability Agenda. EcoHealth, 1-11. Well-being, Country and nature: What does it mean for Australian Aboriginal Peoples? Yotti Kingsley recently published the article "Developing an Exploratory Framework Linking Australian Aboriginal Peoples’ Connection to Country and Concepts of Wellbeing" in the International Journal of Environmental Research and Public Health. Aboriginal people across Australia suffer significant health inequalities compared with the non-Indigenous population. Evidence indicates that inroads can be made to reduce these inequalities by better understanding social and cultural determinants of health, applying holistic notions of health and developing less rigid definitions of wellbeing. The following article draws on qualitative research on Victorian Aboriginal peoples’ relationship to their traditional land (known as Country) and its link to wellbeing, in an attempt to tackle this. Concepts of wellbeing, Country and nature have also been reviewed to gain an understanding of this relationship. An exploratory framework has been developed to understand this phenomenon focusing on positive (e.g., ancestry and partnerships) and negative (e.g., destruction of Country and racism) factors contributing to Aboriginal peoples’ health. The outcome is an explanation of how Country is a fundamental component of Aboriginal Victorian peoples’ wellbeing and the framework articulates the forces that impact positively and negatively on this duality. This review is critical to improving not only Aboriginal peoples’ health but also the capacity of all humanity to deal with environmental issues like disconnection from nature and urbanisation. Are we focusing on the wrong determinants of health? More than ten categories of infectious disease emergence exist, but none formally analyse past, current or future burden of disease. Other evidence suggests that the dominant public health concern focuses on two informal groupings. Most important is the perceived threat of newly recognised infections, especially viruses that arise or are newly discovered in developing countries that originate in species exotic to developed countries, such as non-human primates, bats and rodents. These pathogens may be transmitted by insects or bats, or via direct human contact with bushmeat. The second group is new strains of influenza arising from intensively farmed chickens or pigs, or emerging from Asian “wet markets” where several bird species have close contact. Both forms appear justified because of two great pandemics: HIV/AIDS (which appears to have originated from bushmeat hunting in Africa before emerging globally) and Spanish influenza, which killed up to 2.5% of the human population around the end of World War I.
Insufficiently appreciated is the contribution of the milieu which appeared to facilitate the high disease burden in these pandemics. Additionally, excess anxiety over emerging infectious diseases diverts attention from issues of greater public health importance, especially: (i) existing (including neglected) infectious diseases and (ii) the changing milieu that is eroding the determinants of immunity and public health, caused by adverse global environmental changes, including climate change and other components of stressed life and civilisation-supporting systems. The focus on novel pathogens and minor forms of anti-microbial resistance in emerging disease literature is unjustified by their burden of disease, actual and potential, and diverts attention from far more important health problems and determinants. There is insufficient understanding of systemic factors that promote pandemics. Adverse global change could generate circumstances conducive to future pandemics with a high burden of disease, arising via anti-microbial and insecticidal resistance, under-nutrition, conflict, and public health breakdown. 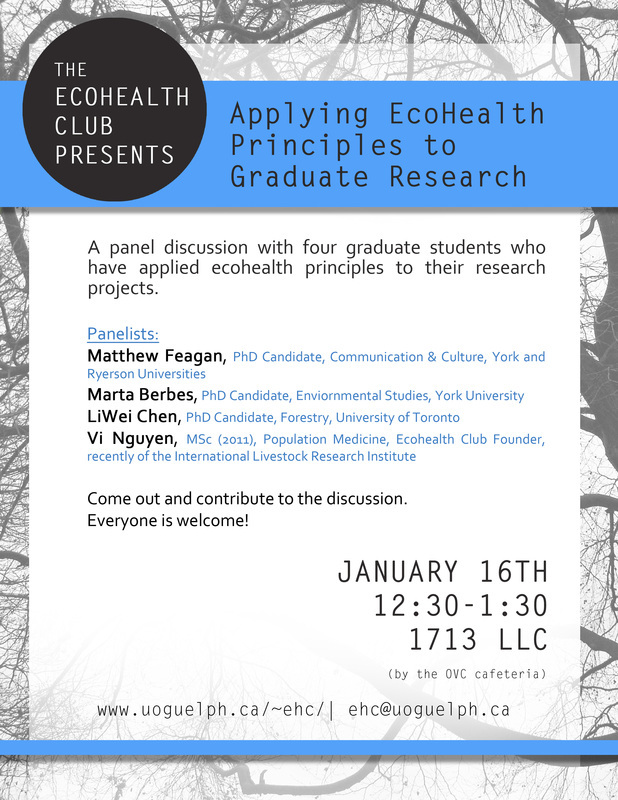 The EcoHealth Club at the University of Guelph will be hosting a student panel discussion regarding the application of ecohealth principles in graduate research on January 16, see details attached. Please distribute widely. As Ecohealth researchers, practitioners, and policy makers, we promote sustainable health and well-being by pursuing transdisciplinary approaches addressing interdependent causal factors of health and well-being, while engaging communities to achieve lasting intergenerational solutions, without compromising the natural, social and cultural capital required for the health of future generations. This document shows that an opportunity exists now: we need to be engaged in the MDGs explicitly, and we are already using our approach to make a difference. In our communities we should consider our projects not just in terms of the Ecohealth approach, but in terms of how they will help attain the MDGs, and contribute to the development of the next iteration. At the beginning of the 21st century, 191 nations committed to significantly reduce poverty, hunger, disease, illiteracy, environmental degradation, and discrimination against women. Since then, these Millennium Development Goals (MDGs) have served as a source of inspiration, guidance and frustration to governmental and non-governmental organizations. Progress has been made toward achieving some goals; others appear to remain stubbornly out of reach. In part, this has occurred because, while we have improved in our ability to articulate and measure MDGs, much less attention has been directed at how such complex, interacting goals can be most effectively achieved. The global Ecohealth community, with a strong history of investigating and testing processes to achieve such complex goals at the intersection, can contribute significantly to attaining the MDGs in a timely fashion. The International Association for Ecology & Health ( IAEH) acknowledges, and endorses, the long tradition of international, regional and intergovernmental organizations that have recognised the link between human health, animal health and the environment, expressed as a series of statements, declarations and agreements. The IAEH also reaffirms its commitment to a Call for Action from the International Ecohealth Forum in Merida in 2008 (Supplementary materials available online at www.ecohealth.net ). The most recent MDGs Report for 2012 (http://www.un.org/en/development/desa/publications/mdg-report-2012.html) lists important progress, including meeting targets on poverty reduction, improving the lives of slum dwellers and access to improved sources of water, but stresses the need for a true global partnership to achieve remaining goals and targets by the 2015 deadline. The current economic crises must not be allowed to decelerate or reverse the progress that has been made. Indeed, it states that the contributions of national governments, the international community, civil society and the private sector will need to take on the longstanding and long-term challenge of inequality, and press forward on food security, gender equality, maternal health, rural development, infrastructure and environmental sustainability, and responses to climate change. The achievement of health as expressed in the MDGs is also dependent on creating and maintaining healthy ecosystems. These goals require broad involvement and cooperation among community members, practitioners and decision-makers from a variety of institutions. When different stakeholders are not equitably represented in the decision-making process, or they cannot communicate effectively with each other, solutions are stifled or not viable in the long-term. Similarly, when only human stakeholders are considered and reductionist approaches are adopted, solutions turn out to be only a temporary relief often leading to new levels of problems. The Ecohealth community works from these suppositions. Ecohealth researchers and practitioners have already made a conceptual and structural move in research towards a scholarship that is adaptively oriented, and action-research based. Such a shift has been occurring not only at academic levels, but most importantly at civil society level including local communities, government (national, regional, local) and international (intergovernmental, non-government and multinational corporate) levels. Leadership in Ecohealth at all of these levels is important and recognised by organisations proclaiming an Ecohealth approach. The Ecohealth community also foregrounds the needs and aspirations of local and Indigenous peoples for whom these MDGs are also highly relevant. This challenge is also a significant and timely opportunity for the IAEH and Ecohealth practitioners to raise the bar of global health targets. From the start, Ecohealth research and practice has emerged with the values and instruments to cross traditional boundaries of sectors, disciplines, and knowledge cultures. While the Ecohealth approach embraces the tools of core domains such as public health, ecology, and ecosystem management, its emphasis on interdisciplinarity and cross-sectoral collaboration enables it to transcend important limits and blind spots of individual fields of expertise. Our commitment to accounting for and celebrating the interdependence and diversity intrinsic in human-centred ecosystems could yield solutions that remain viable and generative in the long-term. Our dedication to involving whole communities, and defining human health holistically in terms of its physical, mental, social, inter-species and ecosystem facets could make Ecohealth solutions widely accepted and deeply nourishing. Ecohealth researchers and practitioners accept that continents, oceans and the atmosphere are undergoing significant change. They acknowledge that human societies are changing in response to these, and other drivers. They accept that as people we are behaving in ways that we have never before. There are no single solutions to the human condition in these contexts. And there are better ways of acknowledging their complexities and uncertainties. The development of integrated health, social and environmental impact assessments for policies and development. The consideration of trade-offs between ecosystem services and human health and well-being and animal health and their resolution according to the principles of sustainability and equity. The adoption of a people-centred approach for ecosystem management and research that does not diminish the (actual or perceived) importance of biodiversity in sustaining ecosystem services. The adoption of a deliberative rather than hierarchical approach in research design, inclusive of local people in their MDG aspirations and not defined by finance or positions of power. The identification of shared values of principal partners and responsible stakeholder groups, often across disciplines and between sectors. Taking action to remove barriers that limit consensus through engagement and skill sets such as humour, patience, tolerance, and a willingness to reciprocate; and seek to have the development of these skills included as part of national curricula or sustainability literacy. The strategic development of appropriate mechanisms to enable health costs to be satisfactorily included in development options and ecosystem management. A development of price-based incentive mechanisms for ecosystem services that currently exist outside of markets, in order to adjust inappropriate personal and institutional behaviours. The development of proactive policy and incentive schemes that aim at measures to reduce consumption, raise awareness, develop curricula, empower communities and promote participation for the ecosystem - human health nexus. The need for appropriate cross-sectoral partnerships for capacity building: improving communication, and empowerment of groups particularly dependent on ecosystem services or affected by their degradation, including women, indigenous people, young people and the elderly. The recognition of connections among human, animal and ecosystem health through political commitment and policy interventions to maximize the likelihood of ecosystem services, social capital and human health co-benefits. These are achievable by, inter alia, the recognition of unintended consequences, an awareness of trade-offs, promoting appropriate cross-sectoral governance, and organizational change to better enable collaboration across mandates. What does Ecohealth have to offer? The achievement of health as expressed in the MDGs is dependent on creating and maintaining healthy environments and societies. This requires broad cooperation among agencies and practitioners from a wide variety of intergovernmental, nongovernmental, and governmental departments and agencies, bringing a diverse set of skills and expertise to bear on the complex challenges posed by these lofty goals. The challenge accepted by the International Association for Ecology & Health (hereafter ‘The Association’), and by ecohealth practitioners, is to bring these relevant sectors together in a meaningful way. The Association acknowledges, and endorses, the long tradition of international and intergovernmental organizations that have recognised the link between human health and the environment, expressed as a series of statements, declarations and agreements (Supplementary Appendix A). The Association reaffirms its commitment to a Call for Action from the International Ecohealth Forum in Merida in 2008 (Supplementary Appendix B). Ecohealth research and practice has emerged with the concepts and instruments to be able to cross the boundaries formed by sectors, disciplines and knowledge cultures. It has all the attributes of public health, ecosystem management and sustainable development, and should be identified as belonging to these fields of human endeavour. Yet it has emphases that are beyond them in isolation. It stresses i) an understanding of the dependence of health on ecosystem services, ii) the centrality of social determinants of health, and iii) the involvement of communities in the solution of the problem of the human condition. What is needed for the MDGs now, and what will the next iteration require? What contributions could be made now to improve MDG outcomes by 2015? Undertake health impact assessments for policies and developments, incorporating an assessment of ecosystem services. Where trade-offs are being made, human health for ecosystem services, or vice versa, they need to be considered and valued according to principles of sustainability and equity rather than ignored or dealt with on financial terms only. A people-centred approach in ecosystem management, which does not diminish the importance of biodiversity, will help achieve co-benefits of sustainable ecosystem management and the Millennium Development Goals. Resolving matters of trade-offs across levels of human involvement from the personal to the global, is achievable with dialogue, using a deliberative rather than hierarchical approach, to ensure the local interests of people are not marginalized by more powerful forces. What could ecohealth contribute to the formulation of SDGs? Policy interventions are proposed to promote multiple interacting outcomes, cognizant of trade-offs, and hence be targeted at promoting cross-sectoral governance, organizational change to better enable collaboration across bureaucratic mandates, and action-oriented teams, with an overall goal to maximize the likelihood of ecosystems and human health co-benefits. Ecohealth researchers and practitioners will facilitate the conceptual and structural move of research and action towards one that is adaptively oriented, and action-research based. Such a shift should occur not only at academic levels, but most importantly at civil society level, government (national, regional, local) and international (intergovernmental, non-government and multinational corporate) levels. Leaders in ecohealth will emerge at all of these levels and should be recognised accordingly by organisations proclaiming an ecohealth approach. The strategic development of appropriate mechanisms to enable health costs to be satisfactorily included in development options and ecosystem management is recommended. Rationalized incentive structures need to exist for the ecosystem services that currently sit outside of markets, in order to adjust inappropriate personal and institutional behaviours. Payments for ecosystem services that align incentives with conservation needs, and elimination of subsidies that promote excessive use of ecosystem services, are some of the policy approaches that can be taken. Incentive schemes and policies must aim at measures to reduce consumption, raise awareness, develop curricula, empower communities, promote participation in issues where the ecosystem - human health nexus exists. Cross-sectoral partnerships for capacity building: improving communication, and empowerment of groups particularly dependent on ecosystem services or affected by their degradation, including women, indigenous people, and young people, will improve the likelihood of a double dividend: improved health outcomes and better management of the ecosystems that provide ecosystem services. Identifying principal partners and responsible stakeholder groups, often across disciplines and between sectors where barriers and boundaries exist, requires a particular form of engagement and skill set: humour, patience, tolerance, and a willingness to reciprocate. These engagement skills need to form part of national curricula, a form of sustainability literacy. Please join us in Kunming for a workshop we are planning entitled, "Barriers and Bridges to integrating Eco-health into policy applications: A global reality check," in which we will explore experiences of policy applications of ecohealth in different regions around the world. While the ecosystem approach to human health attempts to apply a holistic approach to promote knowledge translation and equity at its heart, documentation of successfully applying this approach to a scale of policy application remains limited. To take stock of progress in meeting this challenge, we are organizing an interactive workshop that will: i) propose a framework for policy analysis for discussion and review, based on a scoping review of literature explicitly addressing the application of ecohealth approaches to policy; ii) present case studies drawn from communities of practice operating in different continents (Africa, Latin America, Asia, Middle East); and iii) Conduct small working group discussions on the concepts of barriers and bridges, notions that have often been used to reflect on the function of adaptive systems. We hope to stimulate the development of consensus on a research agenda around key policy-related questions that should receive increased attention prior to the next Eco-Health conference, allowing evidence to be accumulated on effective methods for integrating ecohealth approaches into policy. Along with this workshop, some of us are presenting other related research individually as well as part of a second wokshop entitled "Visioning for Abidjan 2013: tools and emerging processes from Sub Saharan Africa". The aim of this workshop is to contribute to consolidate ongoing collaborations towards the goal of strengthening the vision and plan for activities on the first Africa Regional Ecohealth Conference to be held in Abidjan (Côte d'Ivoire, West Africa), October 1-5, 2013 ("Africa2013"). Recognizing that Africa shares with the rest of the world the challenge of change management, epitomized by climate issues, participants will focus on the path forward as a transdisciplinary process that spans a range of academic, social and environmental considerations. Thematic integration for the workshop will include advocacy strategies and tools for Ecohealth solutions as well as the critical future role of today's young researchers and practitioner networks, while also engaging one of the primary African challenges that clearly requires an Ecohealth approach - the question of adequate and sustainable water. About us... The "Groupe Policy" was formed in August 2010, following the Eco-Health conference in London. Since then we have met regularly on Skype, resulting in a number of rich discussions and a recent publication in the journal EcoHealth (2011, Vol. 8 No. 4). Perhaps the most rewarding aspect of our group has been the opportunity to get to know each other through the work we've done together so far. The nick name "Groupe Policy" reflects the two working languages (French and English) of the current members of the group. The Groupe Policy are Brama Koné (Abidjan, Côte-d’Ivoire), Mathieu Feagan (Toronto, Canada), Nicolas Brou (Abidjan, Côte-d’Ivoire), Yveline Houénou (Abidjan, Côte-d’Ivoire), Jerry Spiegel (Vancouver, Canada),and Edouard Kouassi (Montreal, Canada).